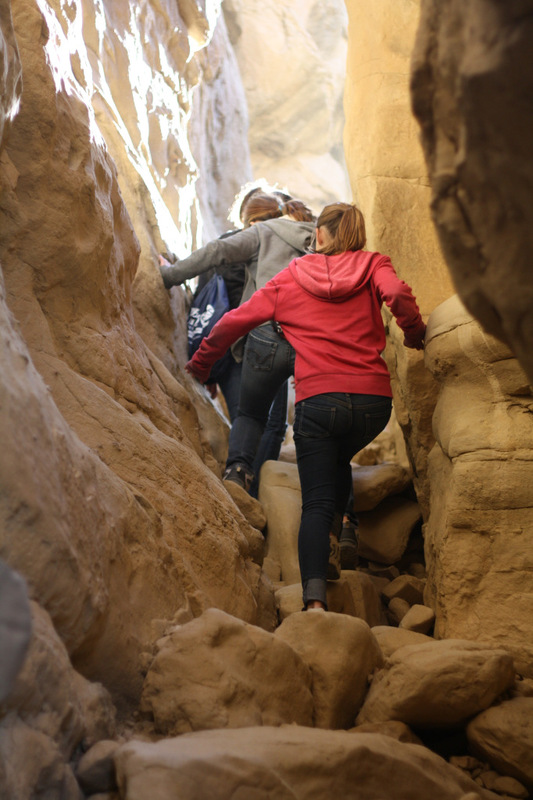 Scholars climb the steep crevices of Chaco Canyon during last year’s Freshman and Sophomore camping trip. — Project managers at ASK are working hard to plan this year’s freshman and sophomore camping trip. According to Project Manager Daniel Barbour, the three days in the Jemez mountains will be a learning experience for all. “I want the scholars to understand that life is about learning and there are some very incredible things in New Mexico to discover,” he said. Barbour will be directing the bait fishing activity, and possibly helping with an ecology class during the trip. The rest of the events have been divided among the other managers. A ten-mile hike , a bouldering excursion, and a trip to the hot springs are on the schedule. Barbour said this year will be different from the last because there are new fresh-faced students and Project Managers at the ASK Academy. The Jemez mountains was chosen as this year’s destination because the staff was familiar with the area, and the location is filled with interesting and educational spots, like the hot springs, the fish hatchery, and the beautiful high-peaked trails. Last year the camping trip took freshman and sophomores to Chaco Canyon for two days and three nights. Project Manager Karen Pierce is the director of the annual trips. She said she doesn’t mind all the extra work that goes into planning the trips because it is a time for the students to bond not only with other classmates, but also their project managers. Last Thursday she passed out the permission slips and schedules for the Jemez trip, scheduled for September 26-28. There are a limited number of available spaces, so she said it’s important to get permission slips and the $50 fee in soon. Students who receive referrals of any kind will be barred from going on the trip and their $50 deposit slip will not be refunded. Sophomore David Galloway said that last year’s Chaco Canyon trip was fun and exciting, and he met a lot of people. His favorite activity from Chaco was the 9 1/2 mile hike. He has never been to the Jemez Mountains and is excited to go this year. He said he would recommend freshman go on the trip, especially if they don’t know many students on campus. Sophomore Michael Medina said last year’s trip was fun and he liked being with his friends. As a freshman, Michael remembers being a little nervous, and even considered not going, but the trip proved to be well-worth it in the end. Freshman Zane Kelley Carmichael plans to go on the trip this year. “It’s a good learning experience while having fun,” he said. He is already an avid camper with the Boy Scouts and thinks it’s important to unplug from society and electronics every once in a while. Freshman Aspen Poole agrees with that sentiment. “The fact that our world is so into electronics, it is important to take a break from them, since we practically live off of them,” she said. For more information about the trip, contact Project Manager Karen Pierce at kpierce@theaskacademy.org. Last year’s camping trip was an amazing learning and bonding experience. You got to become closer to manager and scholars alike all while learning about the history of our state. This year’s trip sounds exciting and a perfect opportunity to bond again. It’s a bummer I can’t go this year. Last years underclassmen trip was great. Everyone had fun and enjoyed it. My dad is coming to this upcoming trip! Can’t wait to have my dad with me on this trip. Love you Dad. Can’t wait for a great trip!